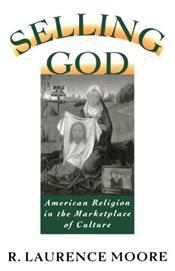 Religion in America is up for sale. The products range from a plethora of merchandise in questionable taste--such as Bible-based diet books (More of Jesus. Less of Me), Rapture T-shirts (one features a basketball game with half its players disappearing in the Rapture--the caption is "Fast Break"), and bumper stickers and Frisbees with inspirational messages--to the unabashed consumerism of Jim Bakker's Heritage USA, a grandiose Christian theme park with giant water slide, shopping mall, and office complex. We tend to think of these phenomena--which also include a long line of multimillionaire televangelists and the almost manic promotion of Christmas giving--as a fairly recent development. But as R. Laurence Moore points out in Selling God, religion has been deeply involved in our commercial culture since the beginning of the nineteenth century....Ranging from the rise of gymnasiums and "muscular Christianity," to the creation of the Chautauqua movement (blending devotional services with concerts, fireworks, bonfires, and humorous lectures), to Oral Robert's "Blessing Pacts" and L. Ron Hubbard's Church of Scientology, Selling God provides both fascinating social history and an insightful look at religion in America.